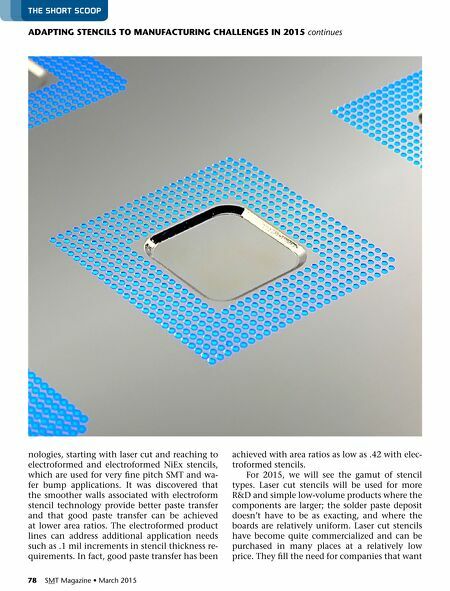 March 2015 • SMT Magazine 79 aDaPTInG STEncILS TO manUFacTUrInG chaLLEnGES In 2015 continues the short sCooP off-the-shelf stencils they can get quickly. Electroform stencils will still be used exten- sively for 20 mil- to 12 mil-pitch SMT applica- tions and chip components like 0201 and 01005. We have seen a recent increase in the require- ments for two-level PCBs with components on both levels as well as the need for step stencils to accommodate boards with different size components. Both of these types lend them- selves to electroform stencils. In addition, electroform sten- cils are being used in the semi- conductor process for µBGAs, flip chip, and wafer bumping so cleanrooms are being re- quired for the manufacture of electroform and NiCut stencils to ensure the cleanliness of the stencils throughout the entire manufacturing process. Most stencil types create the aperture by removing stencil mate - rial through processes like chemical etching or laser cutting. Electroformed stencils are created through an additive process, building up materi- al thickness atom by atom. This keeps the inside release edge of the stencil perfectly smooth, but it is a significantly more time-consuming and expensive process. We saw in 2014 that manu- facturers needed the printing results that could only be obtained with an electroform stencil, but couldn't afford to wait the extra time for them to be manufactured. This desire to secure stencils immediately is continuing, so stencil manufac- turers are looking for other materials that give the same results as electroform stencils, but are less expensive and have a fast turn-around. One such stencil that has recently been de- veloped is the NiCut stencil. It delivers the qual- ity advantages of an electroform stencil, but doesn't need the time to "grow." NiCut stencils give excellent results for fine pitch components including BGAs, QFNs, and resistor networks. They deliver the quality advantages of an elec- troform stencil, but with faster turn-around time. This technology is being used for step sten- cils. Extensive print studies have demonstrated that NiCut stencils have paste transfer efficien- cies better than normal laser cut stencils and just below electroform stencils, yet at a lower price than electroform stencils. When components are small and close to- gether, it is difficult to deposit the right amount of solder paste. Too much solder paste can cause defects such as bridging, solder balls, and short circuits, but too little paste can cause loose components, faulty con- nections, and failures in the field. It is difficult to examine a solder joint with the naked eye and even many inspection machines can't discern all ar- eas of the component or sol- der joint. This has given rise to a growth in the solder paste inspection equipment market. 3D inspection equipment is being employed to capture all sides of the solder joint, which provides feedback as soon as the paste has been deposited in - stead of when the board is at the end of the assembly line. 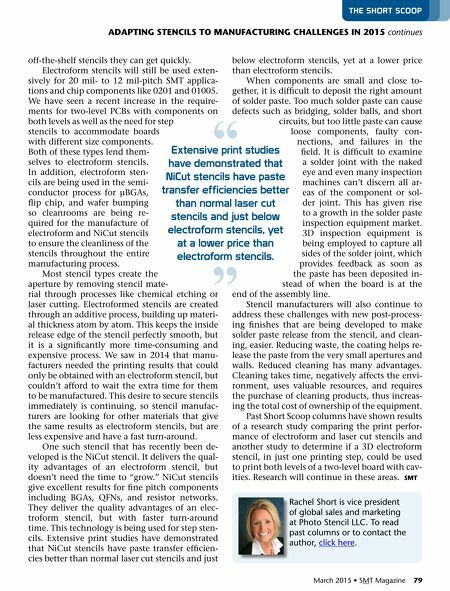 Stencil manufacturers will also continue to address these challenges with new post-process- ing finishes that are being developed to make solder paste release from the stencil, and clean- ing, easier. Reducing waste, the coating helps re- lease the paste from the very small apertures and walls. Reduced cleaning has many advantages. Cleaning takes time, negatively affects the envi- ronment, uses valuable resources, and requires the purchase of cleaning products, thus increas- ing the total cost of ownership of the equipment. Past Short Scoop columns have shown results of a research study comparing the print perfor- mance of electroform and laser cut stencils and another study to determine if a 3D electroform stencil, in just one printing step, could be used to print both levels of a two-level board with cav- ities. Research will continue in these areas. SmT extensive print studies have demonstrated that niCut stencils have paste transfer efficiencies better than normal laser cut stencils and just below electroform stencils, yet at a lower price than electroform stencils. " " rachel Short is vice president of global sales and marketing at photo Stencil llC. To read past columns or to contact the author, click here.